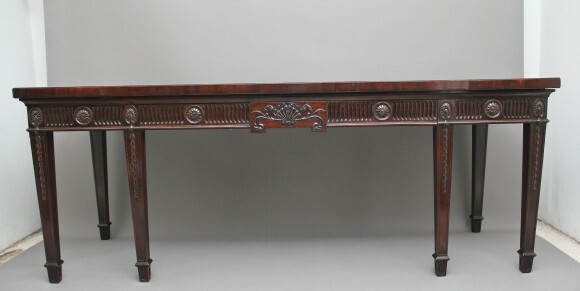 A large and impressive 18th Century mahogany serving table in the Adam style, the wonderfully figured top above a fluted frieze with two frieze drawers, the frieze decorated with carved oval and circular pateraes and a carved floral and shell decoration at the centre, the sides of the serving table has the same wonderful detail as the front, supported on six tapering legs with carved harebell detail. Fabulous colour and in excellent condition. Circa 1790.